I recently realized that I’ve never posted the one dish that we had every Thanksgiving and Christmas when I was growing up–Cornbread Dressing. That’s mainly because I’ve always counted on my mother to make it. 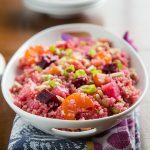 Even after I became vegetarian, my mother would set aside part of the dressing before she added the giblets or oysters or shrimp and bake it with vegetable broth separately for my vegan family and me. But because it’s a dish I love so much, I wanted to share it with you, so I took on the responsibility of making it myself this year. As I mentioned, the traditional version usually has some kind of meat in it and a couple of eggs. 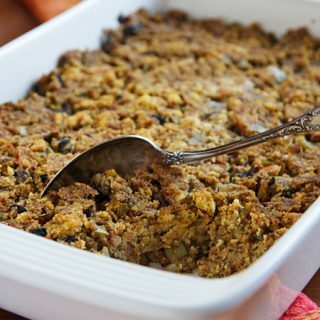 Instead of meat, I make vegan cornbread dressing with diced portabella mushrooms, which mimic the meaty texture and add a deeper, umami flavor. And as for the eggs–well, I just leave them out and add a touch of nut butter for richness. The dressing is so full of the savory, herbal flavors of thyme, rosemary, and sage that nobody misses the eggs. I start by making a very basic cornbread. My mother, wise woman that she is, always remembers to make it a couple of days ahead so that there’s one less thing to do right before the big holiday. She also taught me to start saving the ends of bread a couple of weeks beforehand; you can keep them in the freezer and defrost them right before you need them. We always serve this dressing with a healthy drizzle of mushroom gravy, which also goes on top of the Baked Tofu that is almost always our holiday main dish. And it wouldn’t be Thanksgiving without Cranberry Relish, Green Bean Casserole, and either Sweet Potato Casserole or Impossible Pumpkin Pie. What a feast! Feel free to substitute any vegan meat for the mushrooms. Tofurkey or seitan sausages make a very rich dressing. Once the cornbread is cool, crumble it into a very large bowl. It does not have to be completely broken down into crumbs, but there should be few pieces larger than 1/2 inch. Tear the whole grain bread into small pieces (you can do this in two batches in the food processor, if you like) and add it to the cornbread. Heat a large non-stick skillet. Add the onions and celery and a splash of water and cook until the onions begin to soften, adding water by the tablespoon if necessary to prevent sticking. Add the mushrooms and garlic, a tablespoon or two of water, and cover. Cook until the mushrooms soften and shrink, about 4 minutes. Add the vegetables to the crumbled bread. Stir in the thyme, sage, rosemary, and black pepper, making sure the seasonings are evenly distributed. Stir the soy sauce and nut butter, if desired, into the hot broth. Pour it over the bread mixture, stirring as you go. Bread should be thoroughly moistened but not swimming in liquid. Check the moistness and add additional broth as needed. (I used an additional 2/3 cup broth.) Check the seasonings and add salt and pepper to taste. Sprinkle with a little smoked salt, if desired. Preheat oven to 350. Oil a large, 9×13-inch baking dish. Transfer the dressing to the baking dish and smooth the top without packing it into the dish. Cover with foil and bake for 30 minutes. Remove the foil and bake for 20-30 more minutes, until top is brown but dressing is not dried out. Serve hot with Mushroom Gravy. If you’re still making up your Thanksgiving menu, don’t forget to check out my master list of Thanksgiving Recipes, which has everything you need, from main dishes, to side dishes, to desserts. Also, check out this terrific Vegan Thanksgiving Pinterest board filled with dozens of recipes pinned by a select group of vegan bloggers and cookbook authors. So many recipes, so few holidays! I wish you all a happy, healthy Thanksgiving. Enjoy! This looks fabulous! So homey and earthy. And it can easily be made gluten free. I might try using some millet bread for the gluten free bread cubes. Thanks for sharing your family tradition. A happy, healthy Thanksgiving back to you and yours! Thanks so much, Maria! Your Pumpkin Pie in the Free World looks fabulous too, and I love the name! I am Cajun and a pretty darn good cook. Thanks to you I cook most of the Cajun dishes I grew up enjoying, only your recipes are much healthier and still taste great. You are absolutely great! Thank you, thank you, thank you for your site and what you do. Compton, I’m so glad to hear that! I try to make my Louisiana recipes as authentic as possible, so I’m thrilled to hear that they’re working for you. Thanks for commenting! 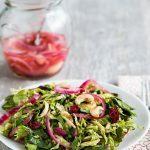 This sounds so yummy-the whole holiday menu with links to the recipes sounds great too! Have a nice holiday! Thanks, Sandy! Happy Thanksgiving to you! I hopped online to look for exactly this! I made to Stuffed Seitan last night and loved the filling, but I am not sure how it will go over with my non-vegan parents for the big day. Tonight I am testing Dreena’s No-Fu Love Loaf. Fingers crossed for love from the omnivores arriving tomorrow night! I may just break down and get a small turkey for them, but maybe not… there will be enough delicious dishes on the table, thanks to you! I am not sure how to enter these two recipes, but my family’s Thanksgiving came early this yea, yesterday. 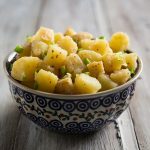 Sunday we had some wonderful vegan foods and two that I made turned out absolutely wonderful so I thought I would share it before the traditional Thanksgiving in case someone else wants to make these two most simple but delicious side dishes. The cranberry sauce I made was: 1 package of cranberries cooked in about 2/3 cup water until they all burst and then cook about 3 to 5 minutes longer to condense. Pour cooked cranberries into a blender, add approx. 2 to 3 teaspoons Chia seeds and the entire inside of a peeled naval orange. Add about one to two teaspoons lemon juice, one full 8 oz. package of blueberries and some sweetener to taste. (I used three or four teaspoons of Truvia crystals.) Blend all together and pour into a serving bowl. It will “gel” pretty solid without any other ingredients. The blueberry, orange and cranberry flavors really make for a flavorful blend. Mine ended up making over a quart and with just 8 of us for dinner we almost finished the entire bowl, it was that good. The chia seeds were exactly what I needed to get it to gel naturally and of course the chia seeds adds a good nutrient also. Make this a day in advance because the chia seeds will harden even more on the second day. This cranberry sauce was better than any I have ever had and everyone at the table commented on how wonderful it was. I do not know who to credit for this idea other than to say that when someone started the chat about chia seeds, costs, etc. and I was just starting a cranberry sauce, I decided to add the chia instead of commercial stuff like gelatin to see if maybe it would work for making it thick. It was so delicious and with every bite I ate I felt I was getting healthier. 2. Wash and core the apples being sure to remove the seeds, and cut into wedges. Put half of them in the Vita Mix, add one teaspoon of lemon juice and 1/2 teaspoon of cinnamon. Turn on the Vita mix for a few seconds. Stop and push it back into the blades if necessary. 3. Then add the rest of the other fresh apple pieces. Run the vitamix until all of it is warm and oh so fragrant. use spatula to reposition the apple sauce if necessary. About 4 to 5 minutes off and on, ..mostly on.. The sauce will turn a pinkish brown because of the skins but the taste is divine! It will thicken slightly after refrigeration. Adjust flavors if necessary…I added about four teaspoons of truvia at the end. Again, the 8 people at the table praised that applesauce as some of the best they ever tasted. It is funny that the applesauce looks and tasted like the canned kind only much better but all it was was basically just a bunch of different raw apple wedges vitamixed together. Sounds absolutely marvelous! Thanks for sharing. You mentioned gelatin, which made me wonder if you know it is definitely not vegetarian. I’m an American living in Australia, and corn meal would be hard to find here. I can find polenta, however – it looks similar, just a different grind I would think. I know my momma, rest her soul, would say it’s not real cornbread if I used that (she was from Tennessee) but I’m wondering if I could use that in this recipe. What do you think? Otherwise the only thing I could use is Jiffy corn bread mix, which they do import here at the USA Foods store in Melbourne. I LOVE this recipe! I am totally going to make it for my family, thank you! this looks so yummy!!!!!!!!!!!! perhaps next year . . . Yes! Making it ahead of time is fine. I should have mentioned that. Thanks for reminding me! Thank you for such a wonderful sounding recipe! I think I’m going to go make it! My question: I’m wondering, why do good cooks like you not promote nor put in their recipes to use a non-aluminum baking powder? Honestly? Because I don’t believe it matters. And the people to whom it does matter already know what to use. I don’t get it! What is it? is it used to dress something…. Traditionally it was used to “dress” or stuff a turkey. Now it’s a casserole or side dish used to dress up a plate of baked tofu! Can’t wait to make this. Love dressing as I am a Southern girl too. That seriously looks heavenly! Lots of ingredients but totally worth the effort by the look of it! Hope your having a great Thanksgiving! I’m from the South as well, and my mom’s dressing is very similar (though she has never added any kind of meat to it). One thing she does differently, however, is she adds the celery, onions, and seasonings (sage, etc.) to the cornbread before baking it. And she always made the cornbread a day or two in advance as well. She said that putting almost everything in the cornbread made it a quick dish to fix the day of (Thanksgiving or Christmas). When cooking the dressing, really all she did was mix in the bread and the broth, put into a casserole dish, and dot with butter (or not if she was cutting back on fat). And heat! I forgot to put that it! Thanks for this great recipe! 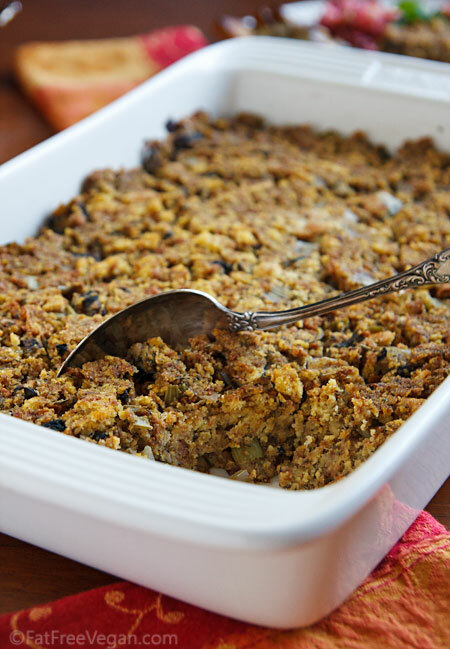 Made the gluten-free version of this vegan Southern-style cornbread dressing today to take to my parents’ for Thanksgiving dinner. It was delicious, and went very well with garbanzo gravy (I didn’t have time to make the mushroom gravy, too)! I used fresh sage and thyme leaves. I wasn’t sure how much to use, so I just winged it. It seemed fine, a little on the mild side, herbally, although that might have been exactly as intended. Please let me know how much fresh sage and thyme leaves I should have used. Thanks again, and Happy Holidays! I’m glad you liked it! When using fresh herbs, I always double or triple the amount of dried called for. Thanks for the tip, Susan! Next time, I’ll try to be a little bolder in my use of the fresh herbs. By the way, for the gluten-free bread, I used Food For Life’s Gluten Free Brown Rice English Muffin. I’d started to crumble Food For Life’s Gluten Free Brown Rice Bread, but tasted it, and realized that it, being fruit-juice sweetened, would be too sweet for the dressing. (These two breads happened to be what I had in my freezer when I decided to make the dressing.) I used up the whole 18 oz. package to make a double recipe of the dressing. I cut up the English muffin into small cubes, rather than tear it, because of its toughness (a previous attempt to make crumbs or small chopped up pieces of it in the food processor had resulted in an unusable paste). For the gluten-free flour in the cornbread, I used a homemade gluten-free flour mixture (sorghum flour, potato starch, tapioca starch) that I also already had in my freezer. I, too, made this dressing gluten free. I had Food for Life Millet Bread in my freezer, which is also fruit juice sweetened. I took a different tack than you, Lorraine, with respect to the sweetness. I decided to go with it. So instead of a yellow onion, I substituted a leek and a shallot from my garden, which are also “sweeter” than a regular yellow or white onion.I was shy a couple of pieces of bread, so I also cooked a bit of actual millet in broth and dried mushrooms and added that. My gluten free mixture for the cornbread was 1/4 cup sorghum flour, 1/4 cup potato flour, 1/4 cup quinoa flour, and 1/4 cup brown rice flour, or thereabouts. It worked very well. I, too, used fresh lemon thyme, since I still have some growing in a pot. It took a lot of chopping to get two tablespoons of it, but I had my prep cooks handy to do that. 🙂 I also used a homemade broth from veggie leavings like leek greens, winter squash innards and kale stems, accented with some my dried mushrooms. The result was really tasty. We all liked it. The English Muffins sound like they made a good substitute, too. There are many ways to tastiness. It’s a wonderful recipe, Susan. Thank you!! I’m glad the fruit-juice sweetened bread worked out! I’d thought of going ahead with the sweetened bread, too, but I was trying to recreate, as much as possible, the flavor of the bread stuffing I’d loved before I quit wheat, which was savory rather than sweet. I like your McGyver approach to substituting cooked millet for the missing bread slices. I’ll remember that for the future! All I have to say is : Delicious! I hadn’t planned on making it, but had a stuffing shortage at my house yesterday. It’ll probably be on the menu for Christmas dinner. Thanks so very much, Susan. Sorry– you’ll probably have to go to the individual pages that you like. I guess you could try printing from your browser but the photos will be small. Thank you! This was Awesome! Before plant based I made a Strata for Christmas breakfast with old bread, milk, eggs, Italian sausage and lots of cheese. all the bad stuff. Wondering if you have a recipe for a savory strata. Sort of like the stuffing but different. Love Your site! Use lots of your recipes! This looks like such a great recipe! 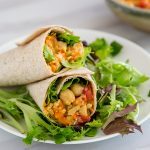 I have been dabbling in vegan recipes lately, and this one is going to be a must try! Does the applesauce help with thickening the cornbread mixture? Thanks for posting this, I can’t wait to taste! The “Southern-Style Cornbread Dressing” interests me be I come from the South and an impeccable, unsurpassed cornbread tradition from my mother herself (the only one). I don’t think she ever served any turkey “stuffing” thing. The dressing, always cornbread, was a separate dish. Her cornbread itself was a lifetime best, although I have enjoyed others. My question is, does this cornbread work as bread? By itself? It sounds good. 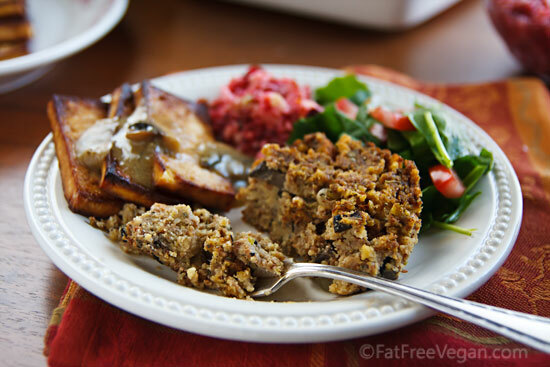 This was my fave of all the delicious vegan things I prepared for this year’s Thanksgiving! So, so flavorful! Even the non-vegetarians at our Thanksgiving loved it and some liked it better than the “normal” dressing/stuffing that was served! I’m coming up on one-year vegan, so this was my first holiday season finding alternate options to what the rest of my family was eating. Thank you so much for sharing your wonderful recipes!! I made the cornbread dressing for my family in Wisconsin at Thanksgiving and it went over very well. Christmas was the true test, as I made it for my husband’s family in Georgia. Success!! They all had their turkey, etc. as well, but only compliments from both families on this, as well as the green bean casserole (a recipe I’ve made for a few years, but veganized this year). So, once again, thank you for your hard work and tasty treats! Susan, I was wondering if you have ever made this in the crock pot and if so, how long did you bake it and on what temp? Thanks. Either way, I am making it for Thanksgiving this year. Thank you for this recipe. This is a delicious stuffing. I spent years looking for a recipe this good…. I know this is an old recipe but can you let me know if the whole wheat bread is just used as is, vs. being dried out as in most dressing recipes? Have you tried it both ways? Thanks! I just used it undried, though several days old. If you use dried crumbs, you may need more liquid. Thanks so much, Susan. I know it’s extra fat but I’m probably going to saute the vegetables in a quarter cup of olive oil for added richness. Can’t wait! I made this for Thanksgiving. It was great. I am hosting Christmas gatherings two days in a row and would like to prepare some things ahead of time. Can I prepare the dressing the day before and cook it the morning that I want to serve it? Yes, that should work perfectly. Glad you enjoyed it! This is my favorite dressing, I sauté the vegetables in 3 tablespoons of olive oil (sorry, not fat free) and eliminate the nut butter. I also dry the bread first, to be more traditional – and yes that does mean using more broth. And I add chestnuts. Fantastic. This recipe was exactly what I was looking for! I don’t plan to change a thing, however I had a question about the nut butter or tahini. I was wondering the purpose of it? Is it to increase the richness of the dish? Which one do you prefer using? Yes, it just adds richness. Either one really will work. I usually have tahini onhand so that’s what I use. I made this today in preparation for Thursday. I used Field Roast Apple Sage sausage (a rare treat) instead of the mushroom. THe sample was fantastic! I can’t wait for Thanksgiving to get here.